Longtime leftist congressman Ron Dellums has died. In a 1976 interview, he explained why corporate control is the problem and democratic socialism is the solution. Ron Dellums passed away yesterday at the age of eighty-two. A lifelong activist, Dellums served in the US House of Representatives from 1971 to 1998 and as mayor of Oakland from 2007 to 2011. He was also a former co-chair of the Democratic Socialists of America (DSA). 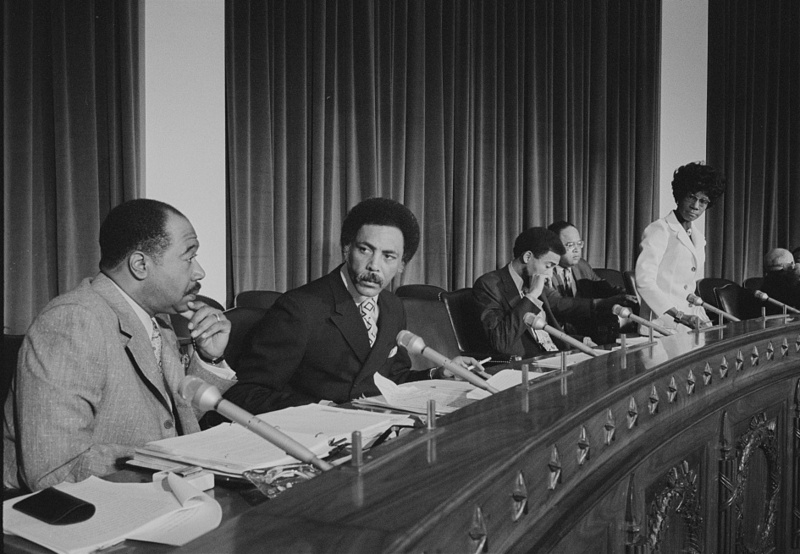 In 1976, journalist John Judis interviewed Dellums for the debut issue of In These Times about movement politics and democratic socialism. We reprint it here in full. An article in the Nation a while ago said you are the closest thing to a socialist elected to Congress in twenty years. Your approach seems like the socialist ideal of uniting working people against corporate power to establish popular ownership and democratic control of society’s basic wealth. Is that your view? I think democratic socialism will ultimately prevail in this country because it makes an enormous amount of sense. We have to ask if the problems in society can be solved while we are propping up the major corporations. Right now the politician’s codeword is the “tradeoff of unemployment for inflation,” but that’s simply a way to ask if one is committed to the 10 or 12 million unemployed or to the top fifty corporations in the US. Obviously, the Ford administration, and perhaps president-elect Jimmy Carter, are committed to fighting inflation, to propping up the corporations as opposed to dealing with the human misery of unemployment. But if democracy means anything, it should mean a government of all the people, by all the people, for all the people. . . .
People have asked, does that mean you are a socialist? Because I advocate society and the government dealing with the basic human services, I guess my answer is yes. The government ought to be in the business of delivering health, education, housing, and basic services to people without a lot of game playing. There ought to be comprehensive childcare, a comprehensive approach to housing, a sane, rational way to finance education. But I also strongly believe in the notion of fundamental individual freedom. The government should not do everything for everybody all the time, but it should provide basic services to everyone who needs them. Education ought not be contingent on income or where you live. Neither should health. What about energy and food? Basic human needs like food cannot be corporate questions. It frightens me that the food business, from the growers to the distributors, is rapidly becoming dominated and controlled by a few corporations, some of whose names give no notion that they grow, process, or distribute food. That’s dangerous, because if there is one thing people ought to be able to do unencumbered by the complexities of economics, it’s eating — a simple proposition. When you complicate eating with economics, you have missed what life ought to be about. Similarly with energy. We are now moving away from fossil fuel, but why should these corporations own the sun if you have solar energy, or own the wind if you have windmill generators, or control the earth if we have geothermal energy? And why should private corporations build nuclear power plants without first solving the technical health problems that are inherent in nuclear reactors? Those things ought to be owned and controlled by the public. We have not done that because the government has not controlled the corporations, but has been controlled by them. That is why our democracy is more symbolic than real. Over the past few years, a number of candidates who share your views have been elected to office in the East Bay. Do you see this as the beginning of a movement? Yes, people in this community are trying to develop a continuity of critical ideas, so that a person who carries the banner of “new politics” into the electoral arena is no more than that — someone who carries a banner. . . . It’s not a machine; it’s the beginning of a movement. What principles define this movement? Our politics are based on four things: a value base, a perceptual frame of reference, a set of goals and objectives, and a strategy by which to seek these. First, we operate from the humanistic value that life is the most precious thing on earth. Not bullets and bombs, or property and money, or prestige and status. But life. If you accept that value, there are enormous ramifications, because then you logically oppose war, pollution, racism, and sexism — all things that endanger or inhibit life. Another value is the right of every human being to realize his or her fullest potential. What inhibits human beings from realizing their full human potential? If you are a woman, sexism; if you are black, brown, or yellow, racism; if you are a senior citizen, age chauvinism; if you are working class or poor, classism. Is classism another word for capitalism? Yes. We live in a class society, one with Rockefellers and paupers. There is something inherently wrong with that. It is in direct violation of the concept of democracy for a handful of people to control the wealth and to have influence that goes far beyond even the actual dollars. So we start with a humanistic value system and ask: what inhibits life and growth? The answer is war, pollution, elitism, corporate corruption, corporate power that controls over 90 percent of the wealth and dominates people’s lives. Third, our objectives are to eradicate the conditions that keep some people in abject poverty, hunger, and disease, while the society protects the extraordinary wealth of others. We oppose a politics that makes a priority of building B-1 bombers and not of building for people in our communities. Fourth, strategy. Coalition politics that brings people together around mutual self-interest. We bring black, brown, and yellow people together, women, students, senior citizens, working-class people, poor people around their common oppression. The degree to which you are able to attract a broad range of people all committed to the eradication of their oppression is the degree to which you can develop a broad political movement. My running for Congress was simply a test of the idea that in one of the most diverse congressional districts in the US it was possible to create an effective people’s coalition. And for three terms this district — 71 percent white — has elected a black person, which means that we are capable of going beyond the dimension of race and coming together around other kinds of concerns. . . .
Ron Dellums (1935-2018) served as a US congressman from 1971 to 1998 and Oakland mayor from 2007 to 2011. John Judis is a journalist and a founding editor of In These Times .